Julie Christensen is a food writer, caterer, and mom-chef. She's the creator of MarmaladeMom.org, dedicated to family fun and delicious food, and released a book titled "More Than Pot Roast: Fast, Fresh Slow Cooker Recipes." When you need a simple, but special, meal idea, it's hard to beat a smoked ham. These hams have already been cooked so they only need to be reheated. The crock pot is an ideal method because it keeps the meat moist and tender. Opt for a ham that weighs no more than 6 pounds. Larger hams probably won't fit in the slow cooker. Add a savory glaze, if you like, and you've got a stress-free meal guests will remember. Buy a half ham that weighs no more than 5 to 6 pounds. One of the main challenges in cooking a ham in the slow cooker is making sure the ham fits. 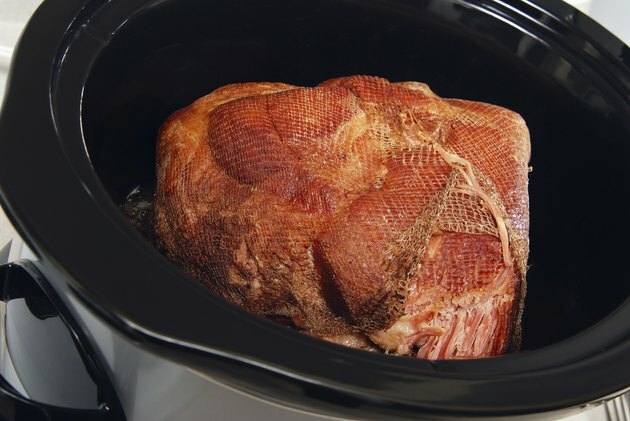 A 5- to 6-pound ham will fit in a large slow cooker. A 3- to 4-pound ham will fit in a medium oval slow cooker. The ham should fill no more than two-thirds of the cooker. Unwrap the ham from its packaging. Remove the plastic disc on the bottom of the ham. Place the ham in the slow cooker. Add a bit of liquid to the slow cooker, such as unfiltered, organic apple juice, water or organic broth. Place the lid on the slow cooker, and heat the ham on low for 2 hours, or until a meat thermometer inserted in the ham registers 140 degrees Fahrenheit. Mix a healthful glaze from pineapple juice, grainy mustard and low-sodium soy sauce, if you like. You can also make glazes from softened fruit preserves, such as apricot jam or even chutney. Spread the glaze over the ham and turn the heat to high. Leave the lid off. Cook the ham for an additional 20 to 30 minutes, or until the glaze thickens and slightly caramelizes. It's still possible to find hams that have been smoked or cured, but that have not been cooked through. These hams -- often labeled as country hams, Virginia Smithfield hams or picnic hams -- are usually large hams. In general, you won't find one small enough to cook in your slow cooker. If you do, though, soak it in water beforehand to remove the salty brine. Cook it on low with some liquid until a meat thermometer inserted in the center of the ham registers 145 F. Let the ham rest at room temperature for at least 3 minutes before slicing it. Not Your Mother's Slow Cooker Cookbook; Beth Hensperger, et al.